It's time for me to go public with my Second Life User Guide website. I'm announcing this User Guide website even though it is still Under Construction. The site is about 50% complete with respect to what I originally thought it should cover. But it is only about 5% complete with respect to what I now realize should go into it. So why am I jumping the gun and announcing a very-partially completed User Guide? In fact, why am I even trying to make a new Second Life User Guide? New User Guide or new User Interface? More than a year ago, I maintained that Linden Help needs help. I was responding to Wagner James Au's blog post Is Second Life's User Interface Cursed by Knowledge? Wagner suggested, as have many others, that the user experience might be improved by redesigning the Second Life interface. Public opinion has generally followed Wagner Au in focusing on the User Interface. In June of 2008 Dusan Writer announced an 800,000 L Viewer Interface Contest. In July Dusan posted the designs of the contest finalists. And on August 12th he announced at a Metanomics event that the first place winner was the User Interface design submitted by Rheta Shan. Linden Lab has also focused on the User Interface. In September 2008 M Linden announced that they would hire an interactive design firm to create a viewer that is "new user friendly." In November Tateru interviewed Benjamin Linden about the redesign being carried by the chosen firm, Big Spaceship. By June 2009 Tateru got her hands on an early build of the new viewer, and posted a Sneak Peek at the New User Interface. Tateru found this new viewer to be quite a change and called it "fascinating." But Lowell Cremorne writing for the Metaverse Journal found the changes to reflect overly "safe" choices, and even in some cases to be disappointing, such as the disappearance of the pie menus. I remain sceptical about the extent to which a new viewer can improve the newbie experience. In my opinion nothing replaces an online help in text format. Linden Lab has made definite progress with their Second Life Support Center. More than a year ago, when I first tried to consult what was then called the "Second Life Knowledge Base," I had a hard time even finding it. Starting from their Support page I had to follow a long train of links (I think I even had to log in at some point). The information in the Support Center has been organized into rational categories, and greatly extended. But it is still very hard to find the information you are looking for in it. You have to wade through long pages of questions, as on any FAQ (Frequently Asked Questions). When you find a question that seems relevant, you open the page and browse through it. However, there may be many questions on the same topic, and you may read through them all without finding what you want. Linden Lab now also provides a short Quick Start guide, which is a good idea, but too brief to take the newbie very far. The secret weapon of the Second Life Support Center seems to be support videos. More precisely, the secret weapon seems to be Torley Linden himself and his long series of Second Life support videos. These videos are certainly most helpful, but they are for those who have the time and discipline to sit through the equivalent of an online course. Again, when I personally want help with some particular problem, I look for text. Which brings us to the various online tutorials in text format that Second Life residents have already created. If you do a Google search for Second Life tutorial, you will find that they are legion. But most of them are aimed at experienced Second Life users, and concern more advanced skills such as building, creating clothing or scripting. Gwyneth Llewelyn's First Ever Questions or Olila's newbie tutorial (both of which, although high in the Google listings, are by now out-of-date). Some Universities have also posted good one-page introductions, such as this one from the State University on New York. But the single-page format is limited in terms of the information it can convey. 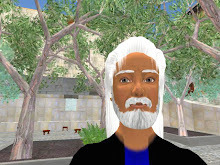 Thus I perceive a real need for something like my planned Second Life User Guide website for newbies who are struggling up the steep part of the Second Life learning curve. The shortcomings of the newbie experience in Second Life are well known. For example, when M Linden announced in September 2009 that viewer improvements would be outsourced, he also mentioned the need to "reinvent" what is called the "first hour experience." A good example of a disgusted newbie was given recently by Grace McDunnough. She was curious about why Jeff Jarvis had said: "Second Life is the most overhyped alleged phenom of the century, so far." Grace studied Jarvis's blog, and found at least part of the answer. Jarvis says about Second Life in one post: "John Markoff admits that he hasn’t gotten past the opening and I admit I have not either." And in another: "I tried hard but just couldn’t get into the thing or figure it out." Taking these statements at face value, the real reason for Markoff's sentiment that Second Life is "overhyped" is that he just simply couldn't get past the opening. I first went through the newbie experience in November 2007. At that time Orientation Island was made up of a central hub, surrounded by four regions, in each of which the new user followed a path between a series of learning stations. The experience was moderately confusing. I remember standing in a stairway repeatedly clicking on a panel that said "click here" but where nothing happened. However, when I had finished the entire route (it took me more than the "first hour") I had learned quite a few skills in the comfortable presence of similar newbies. I tried the newbie experience for the second time six months ago, when I created my first alt. I found it worse than before. There was nothing very useful at all on Orientation Island. I stood in front of a few of the large tutorial panels, which I found hard to read and even harder to capture (with a screen capture), and which covered topics such as a description of the different prims, which is hardly what the newbie first needs to know. Large signs everywhere incited me to go inworld at once, in an implicit recognition that this Orientation Island was a waste of time. The only new element that I found useful was the set of tutorial notecards. But why require newbies to download these notecards one by one, when they could just be placed in the Library? When I went inworld, the experience was worse. I found myself in one of the new demonstration avatars, which I preceived to be very ugly, and which had a body which I was totally unable to edit, because none of the sliders worked. I struggled with this for a long time, becoming increasingly frustrated – and remember that I had already been using Second Life for more than year! I went to an information hub and found someone who was acting as a mentor, but all they could tell me was to go to a such-and-such shop and buy another avatar. So I searched through the Second Life Support Center, reading up, and wrote this page about how to edit your avatar. If you gave a newbie the url for this page, they would at least be informed of all the options available to them, and could for example easily switch to a default avatar in order to have a first experience in the use of the sliders. Many residents have made proposals for improving the newbie experience. For example, Prokofy Neva wrote this long post on the subject. Grace McDunnough offers her own solution which she sums up as follows: "The Second Life interface and attendant new resident churn problems can be solved using Artificial Intelligence and bots." My own proposal is more modest. I'm ready to let Linden Lab fool around as they will with new configurations for Orientation Island, or alternative solutions, paying large sums to external consultants, and coming up with what may likely be little better than what they had before. I'd rather try to give newbies direct access to a more usable online help. Now that I've explained why I am making a new Second Life User Guide, I'm back to the initial question. Why am I announcing this only very-partially completed User Guide? First, I think that even in its rudimentary state, full of red links as it is, it could be of some use to newbies - and maybe even other users. And second, I may never get much further with it. I hope to keep working on it, but I have noticed that online projects tend to grow sporadically, slipping easily into extended periods of hibernation. So I may as well try to publicise this one now, instead of waiting until it has advanced much further. The wait could be a long one. Danton - where are you? Hi HeadBurro, Thanks for asking. I'm still around in SL. I drop into CDS occasionally for a party or meeting. But I've been working more on my RL websites. I'll have to post something here again. How are you?